Each year SfN invites a prominent non-neuroscientist to speak in the series: Dialog Between Neuroscience and Society. These talks are given on the first day of the meeting, in large, ballroom format. 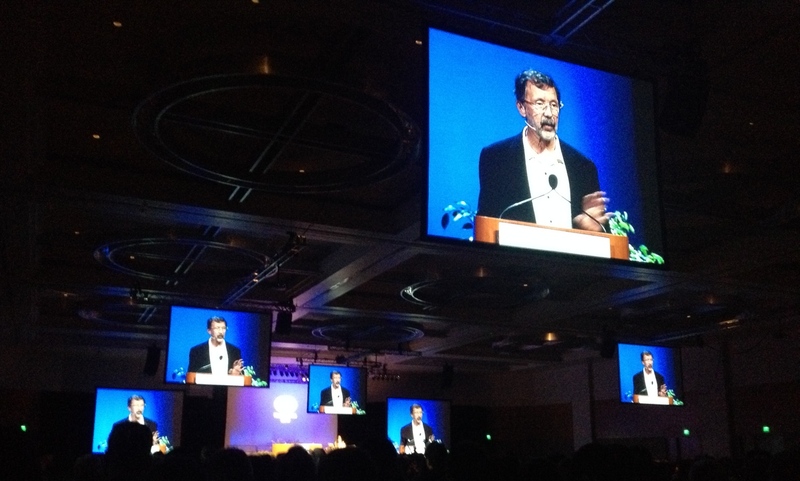 Today’s dialog was given by Ed Catmull, a trained mathematician-physicist whose career has been in developing computer-animation techniques and producing great pictures. Dr. Catmull is president of Pixar the animation component at Disney Pictures. Pixar made Toy Story, the first full-length computer-animated film. Toy Story was, of course, a huge creative and financial success. It has been followed by a string of animated films remarkable in their complexity, creativity and financial returns. How was this done? How can a huge team work for years with one goal, to create a single creative product? What’s the magic formula? Dr. Catmull suggested some answers in his lecture, “The Culture of Creativity“. Although Catmull’s presentation did not directly address neuroscience, it brings to attention the intersection of two current and fascinating topics addressed at SfN: the Neuroscience of Creativity and Social Neuroscience. Listening between the lines, I found his insights in line with my sense of both fields. Group meetings are not set with a rigid framework. It’s not “we have to get from here to there”. Rather, “we have a goal. How can we get there? Anybody have ideas? The workings of the group are egalitarian. Although the members may have different rank on the outside at Pixar, during a Braintrust meeting all members are equal. No inhibition; say what you think; egos left outside the room. No one is punished for a bad idea. Rather, it is understood that most ideas will be bad. The idea is to describe wide-ranging ideas so that good ideas can emerge. Proposals are not made with the goal of pleasing an individual. Rather, selection of a course of action is a group process. Vicarious trials are run in the framework.. The brain constructs a series of action paths and analyzes the consequence of each. As a new action path is executed, it differs from the others based on stratagey, and, perhaps, a bit of chance. Action is inhibited until a “best” action path is created. This path is executed. Dr. Catmull’s task is immense. Creativity is an almost magical production of a single brain. How can you harness the brains of many to create a single creative product? The output of the Braintrust Group shows that this can be done. The organization of the Braintrust group gives hints of the nature of cognition and the creative process. ** Note that the “vicarious” model requires a brain representation of space. If behavior is always immediate, brain representations are required: the world can be its own representation. In the vicarious model the person imagines itself in a place in behavior space that it doesn’t currently occupy. A brain representation of the world is needed to anticipate consequences.